The concluding number of tonight’s “Second Sunday Series” of free concerts at the Rodeheaver Auditorium in Winona Lake, IN, was a trio composed of Elena Dunegan, clarinet; Barbara Kavanaugh, cello; and Jennifer Jackson, piano. They played two movements from the Trio in A Minor, Op. 114 by Johannes Brahms. 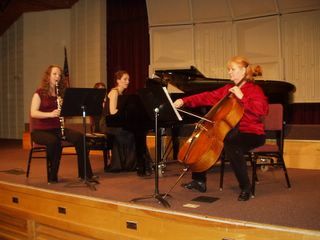 Other performances tonight included piano, mezzo-soprano, viola, violin, and soprano. Each performance was preceded by the reading of a poem on the theme of love, and the audience members were seated at decorated tables in soft candlelight, enjoying desserts and beverages during the program. Most of the performers are interns and faculty with the MasterWorks Festival which will meet in Winona Lake this year June 12- July 17. For more information, click here.